Whenever I visit Oregon I get so excited to see duck on almost every menu. If I wanted to I could have duck something for breakfast, lunch and dinner. I have had duck hash, duck steamed buns, duck phở, duck tacos, and duck confit, although my favorite was always a glass of Oregon Pinot or a Whisky flight and an order of duck egg rolls from Veritable Quandary in Portland. VQ was always a must do every time I made it out there, but I sadly learned that this amazing historical Portland site closed in September of 2016. 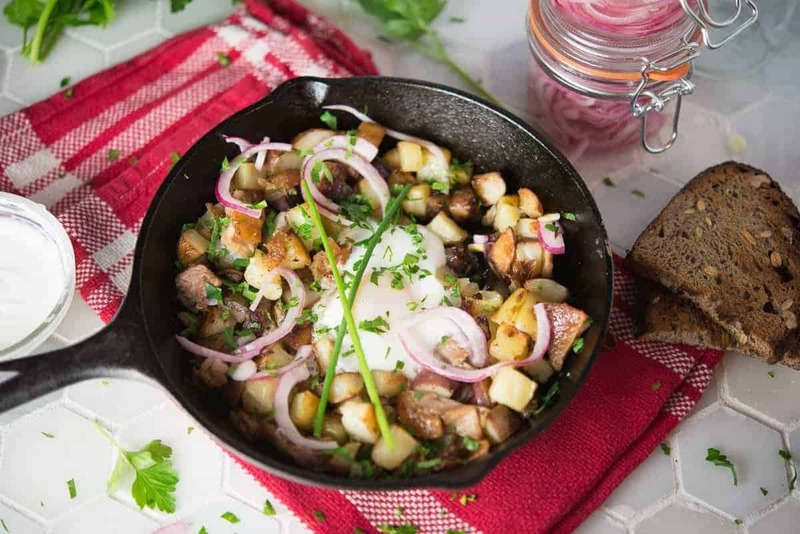 This duck hash recipe was created in an effort to recapture some of the romantic Oregon trips that my husband and I have taken – I ended up making this for him on Valentine’s Day this year. Salty, crispy duck fat potatoes are a beautiful thing all by themselves, but serve them with rich roasted duck and soft poached eggs and you have a magical and super impressive brunch. The roasting of the duck is the most time-intensive part of this recipe but it really is worth it. You end up with a good amount of left-over duck fat that can be used for fries and potatoes for months. I usually keep it in the fridge, and then use it for breakfast potatoes whenever I get a craving for something crispy and salty. Roast at 375℉ for about an hour. Carefully spoon over some of the rendered duck fat over the top of the duck. Continue to roast for another 45 minutes to an hour, until the skin is crispy and a deep golden brown. Heat duck fat in an iron skillet, add the potatoes and brown them. Salt and pepper to taste. Remove potatoes and add duck meat to pan to reheat. Use as much skin as you like. Add potatoes back to the pan, and mix with the duck meat.